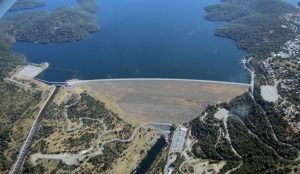 Oroville Dam is an earthfill embankment dam on the Feather River east of the city of Oroville, California, in the United States. California USA has experienced an unprecedented 2016-2017 winter, just as our Lord Jesus had said. Snows have reached record depths exceeding 50+ feet in the Sierra Nevada Mountains with estimates going to 76+ feet by winter’s end. Severe rainfall, called “atmospheric rivers”, have filled dams, lakes and reservoirs to their brink. Now, the central valley of California is facing a disaster that will affect millions as a world renowned dam expert** fears of an imminent failure of USA’s tallest dam in Oroville CA. The 770 foot high & 6,920 foot long dam already has experienced a severe failure in the main spillway where 100,000 cubic feet per second of waterflow is currently scouring the mountain with fierce intensity. The high flow rate, controlled by the dam sluice gate, is necessary to prevent an “over topping” of the main dam and to keep up with the unrelenting rains. This dam is an Earthen Fill type of dam, and is one of the largest and tallest dams in the world (in the top 20). Because of this “earth fill” design, authorities are extremely concerned about penetrating leakage and erosion. These conditions are fatal to “earth fill” dams as a sudden “V” breach may release tremendous cascading volumes of water in a short period of time. This dam provides up to two thirds of the water for the state of California in an elaborate aqueduct system. Authorities have recently Evacuated 200,000 people in many towns as water overtopped a never before tested 1684 ft long “Emergency Spillway”. Authorities were stunned at the ensuing back erosion exposing “rotten rock”. The Emergency Evacuation was triggered due to this unexpected and severe erosion in the secondary spillway, called the “Emergency Spillway”. They were concerned that this swift erosion damage would cascade towards the “Main Spillway”. AS the “Main Spillway” is already severely damaged half way down the mountain side, the authorities have no choice but to keep a tremendous waterflow of 100,000 cubic feet per second until repairs may proceed in the drier season in late Summer or Fall. It is a race between continuing back erosion, the storms, and waiting for dry weather. Note: The Evacuation has temporarily been changed to a “Warning” to allow residents to return to get their belongings, but authorities warn that another immediate evacuation order may come at any instant. The unrelenting winter is pushing in a record series of “atmospheric rivers” that may dump up to 10 inches of more rain in the Oroville Dam reservoir basin in the next week. Any warming of the temperature may multiply the water flow from the snowmelt in the Sierra Nevada mountains. Other Dams, lakes and reservoirs are above 90% capacity. There is no where for the next week of forecasted deluge of rain and snow melt off to go. The Central Valley of California may be facing a crisis of flooding of such massive proportions that some are concerned of the formation of an “inland lake”. In the 1860’s, this same region experienced the formation of an “inland lake” that was devastating***. It was 300 miles long and as wide as the Sierra Nevada mountain foothills to the coastal foothills. If a repeat of this massive “inland lake flood” were to occur today, millions of people will be affected. In contrast, the 1861 “Megaflood” took thousands of human lives, drowned an estimated 800,000 cattle, and bankrupted the state of California. The National Guard has been deployed to assist in this crisis. There are reports of expectations of the National Guard to assist in a new emergency evacuation – including dealing with the influx of displaced people. Prayers would be helpful for those in this crisis.